In the beginning, the universe came into existence as a hot sea of barely-there particles. Soon, matter as we know it appeared:protons, neutrons and electrons, atoms formed. Next in the line were the first organic molecules and then, finally, life. It's a weird twist of fate that large-scale science investigations into these areas have appeared in the same order. While physicists at CERN currently study the origin of the universe and the origin of matter, in the future they may be asked to help crack the origin of life too. "How on Earth has life appeared on Earth?" Image courtesy NASA. In the beginning, the universe came into existence as a hot sea of barely-there particles. Soon, matter as we know it appeared: protons, neutrons and electrons, atoms formed. Next in the line were the first organic molecules and then, finally, life. It's a weird twist of fate that large-scale science investigations into these areas have appeared in the same order. While physicists at CERN currently study the origin of the universe and the origin of matter, in the future they may be asked to help crack the origin of life too. On May 20, a small group of chemists and biologists gathered at CERN for a brainstorming workshop discussing ideas about the origin of life, and to hear from CERN experts about how to organize a scientific community from disparate research groups and how to access powerful computational resources. "There is a serious risk that the answer to the question 'How on Earth has life appeared on Earth?' will mainly remain in the realm of philosophy for the years to come unless we can take definitive scientific approaches," said Stuart Kauffman, an American molecular biologist and complexity theorist who co-organized the workshop with Markus Nordberg, resources coordinator at ATLAS, one of the largest experiments at CERN. At 71 years of age, Kauffman is the doyen of the group, and his ideas can be described as nothing short of wildly ambitious: "The aim of this research group is to create theory and experiments to produce at least one, or several, candidate evolving protocells in the next decade." That is, creating life in a test tube from basic chemical ingredients. Kauffman and his colleagues believe that the crucial step towards life was the formation of autocatalytic sets. An autocatalytic set is a group of molecules which undergo chemical reactions in which some of the molecules catalyze - that is, significantly increase the rate at which the reaction takes place - other reactions in the set. Importantly, though, all molecules mutually catalyze each other's creation, meaning that autocatalytic sets are 'self-sustaining'. It's thought that molecular reproduction and protocells then emerge from such a system. These stromatalites are evidence of the ancient microbes that were the only form of life for 85% of the history of life on Earth before more complex life evolved. 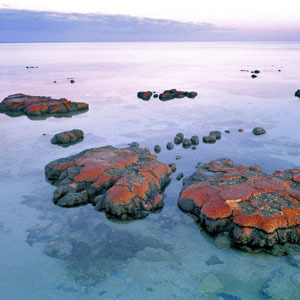 Photo from Shark Bay, in Western Australia, which is a UNESCO World Heritage Site. Image courtesy NASA. "For a long time, it has been debated how likely it is that such autocatalytic sets exist in arbitrary chemical reaction systems," said Wim Hordijk, a computational and bioinformatics specialist at the University of Lausanne in Switzerland. "If I randomly throw a bunch of molecules together, and let them react according to the possible reactions between them, can I expect to see one or more of these autocatalytic sets? Some researchers believe they are very likely to occur. Others believe that it is almost impossible that they appear in a random chemistry - similar, they sometimes argue, to the question of what the probability is that a whirlwind blowing through a scrap yard will put together a Boeing 747," Hordijk said. Until now, little mathematical analysis has been done on this question. But recently, Hordijk developed computer models to explore possibilities and scenarios for autocatalytic sets, in the hope that it could help others figure out how to set up laboratory experiments that would otherwise be too expensive and time-consuming without this prior knowledge. "So far we have used our own personal computers or relatively small computer cluster to run our simulations on. However, we have already run into limitations in terms of available computing power," Hordijk said. Hordijk and his colleague Mike Steel have developed a model of a chemical reaction system where the probability of an arbitrary molecule being a catalyst for an arbitrary reaction was two in a million, a probability that is "chemically plausible" he said. Running this model on the LHC computing grid, he found that, with this level of catalysis, a set of about 65,000 different molecule types or more will have a high probability of forming an autocatalytic set. This is actually reasonable for a chemist in a laboratory to test, he said. "We are hoping to use the computing grid to perform [future] simulations and analyses, which would enable us to go much further and deeper than we have been able to do so far. We have already done some small test runs just to make sure our software runs on the LHC grid [facilitated by the ATLAS experiment], which seems to be the case," Hordijk happily reported. "New science can arise in unexpected ways"
Hordijk is just one of many scientists studying various problems relating to the origin of life. Other areas being explored include self-reproducing RNA, 'metabolism first' theories and self-reproducing liposomes - small vesicles formed when lipid molecules, like fats and oils, align to make a membrane. Almost all the theoretical work is underpinned by complex models that would need large-scale computing power. There are several options for computing power available out there, Bob Jones, project director of CERN's openlab told the group, including other grid infrastructures, supercomputers, clouds and volunteer computing. "Our group of seven origin of life workers, representing an initial group of 22 of the top researchers in the field, were truly thrilled by our CERN meeting," said Kauffman. "If CERN wishes it, we hope to become a small part of the CERN world, for the origin of life is itself a problem in physics. New science can arise in unexpected ways." First, however, the Origin of Life group needs to make a formal proposal for such a project, and CERN must agree formally to support the work. "We hope this occurs. 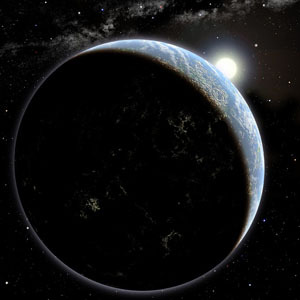 Such approval will help drive an international effort in origin of life research," Kauffman said.